Approach to Counseling | DSM-5 Training by Martha Teater, M.A. I have training and experience in Cognitive-behavioral therapy (CBT). I am a Diplomate with the Academy of Cognitive Therapy. CBT is proven to be very effective in helping people make lasting changes in many areas. This is especially helpful with anxiety disorders such as panic disorder, phobias, post-traumatic stress disorder, obsessive-compulsive disorder, and generalized anxiety disorder, among many others. I have worked in many different medical settings, and am very comfortable with all kinds of health conditions and issues. 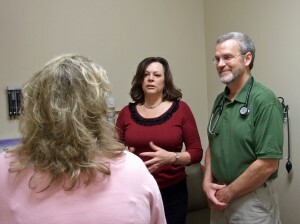 Integrated healthcare is an approach that incorporates medical and mental health needs. With your signed release of information I will be glad to coordinate care with your physician. I also use a variety of other treatment approaches depending on the client and what the concerns are.